The house has four bedrooms. 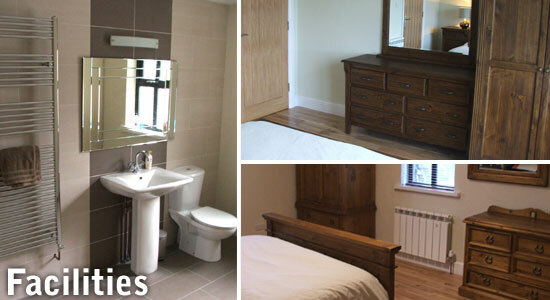 Two master bedrooms with king size beds and generous en-suites. There are two twin bedrooms with two single beds in each. Sleeps 8 in total. 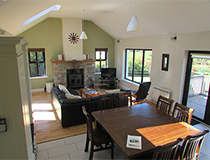 Very attractive fitted kitchen with solid granite worktops and integrated appliances. All modern appliances that you would expect from a residence of this calibre including washing machine and tumble dryer. Open plan sitting and living area with TV, DVD with surround sound and leather furniture. There is a solid fuel stove surrounded by a hand built stone fire place. Raised deck to the rear with stunning views over Derryinver bay and Tully mountain. Travel cot and highchair available if requested. Baby sitting can be arranged with prior notice. Electricity is operated by a €2 coin metre. Average cost per week is approx. €12 - €16 depending on usage. 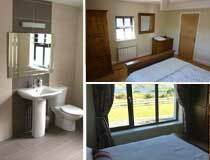 There are no other additional charges for renting Mitchells Cottage. Mitchell’s Cottage is situated 2K from Letterfrack Village. Full local Hackney service available to bring you to restaurants, pubs, etc.